The independent transport videos cameras have returned to the beautiful Mediterranean island of Malta to bring you up to date on the happenings of the bus operations since Arriva pulled out on the 31st December 2013. Our visit took place in February 2014, during the winter months, with very few tourists or holidaymakers present. You will notice the heavy loadings on the buses with the locals making good use of the services, many which were introduced by Arriva during their tenure on the island. All 68 of the former London Mercedes-Benz Citaro articulated buses have now been withdrawn from service. At the time of filming other former Arriva buses were being operated by Government controlled Transport Malta. A tendering process has been put in place for a new bus operator. Many former route buses have been brought back into service, some still in the yellow, white and orange livery to deal with vehicle shortages mainly due to the withdrawal of the Citaros, making our programme all the more interesting! These include some of the BMC Falcons, early King Longs and Scarnif bodied Volvo B6BLEs. Our filming starts at the busy bus station at the capital, Valletta. Various other locations in and around Valletta are seen including Triq Girolamo Cassar. We also visit the pretty fishing village of Marsaxlokk and onto Birzebbuga. Our cameras move around St Julian's Bay filming the action. Look out for former route buses in service with independents now back on normal service routes. There are further visits to Valletta bus station to capture the action and atmosphere. Our cameras then take you around the island to Rabat, Mosta, Mellieha, Bugibba, Cirkewwa, Marsascala and Mgarr. Almost all the bus ‘hot spots’ are covered on our programme, with subtitles to help you identify the locations. 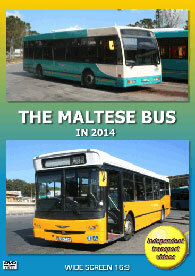 So take your seat and sit back and enjoy this update on ‘The Maltese Bus’.